Happy 1st of May! Hauskaa vappua! 1st of May – Vappu in Finnish – is workers’ and students’ festival, and the closest thing to a carnival we have in this land of quiet, polite people who like to mind their own business. I feel too old to celebrate Vappu with the students, and don’t really share the ideology with the labor union people whose day this really is. 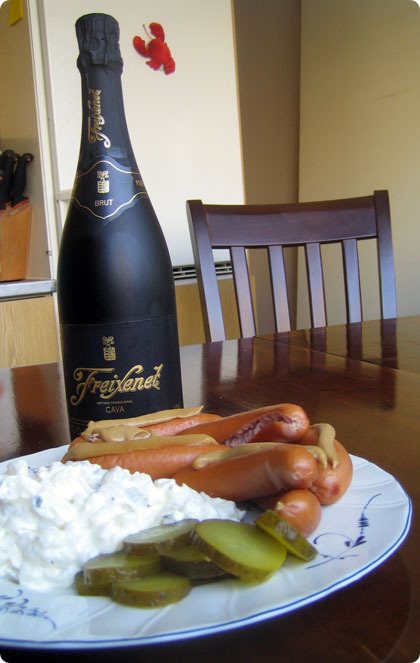 In our family tradition the Vappu food has always been industrial – processed sausages, processed potato salad etc. But at least once a year I find it wonderful to pig out this additive-laden, so-not-good-for-you meal! Mutta Krispy Kremejen makuun p??sseen? mitk? ?n muut munkit ei kyll? en?? v?r?yt? viisaria! And as I haven’t had any Krispy Kremes yet, munkit are still delicious..
Pille, believe me, mom’s sima is 100x times better than any champagne!